Human Hearts can be found in locations where people have performed the Black Sacrament ritual to summon the Dark Brotherhood, along with human flesh. Hearts cannot be taken from dead humans. This ingredient's alchemical effects are identical to mort fleshCC. 20% chance of being dropped by the giant boss in The Cursed Tribe quest. 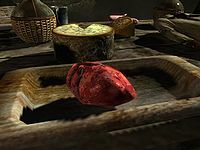 A human heart is one of two items needed at the Atronach Forge to create a Daedra heart (requires the Sigil Stone).